serkan zorba's blog: Big Spin, Not Big Bang! Big Spin, Not Big Bang! My spacetime-rotation model of the universe (see my papers in arXiv and blog posts here) proposes, effectively, to replace Big Bang with a more "natural" Big Spin which, although its own origin needs to be dealt with, does capably unify, and naturally and physically explain many seemingly unrelated and confusing outstanding cosmological problems: the cosmic inflation, dark energy, dark matter, and the "mysterious" intrinsic spin (angular momentum) of elementary particles, and the physical meaning and origin of Hubble's constant and Planck's constant. Again, please see my original dark energy-dark matter papers on arXiv for details. Here I would like to share with you something very exciting that I came across very recently about one of the founding theoreticians of the Big Bang theory: George Gamow. After I came up with my rotary model of the universe, without any prior knowledge of the literature, in October 2010, I learned from Wikipedia that Kurt Godel had (in 1949) a rotary model of the universe that, although useful as an exercise in general relativity, goes counter to our daily experiences due to its infamous closed timelike curves, allowing time travel into the past and a disturbing possibility of messing up with the causal chain of events, which we don't seem to experience. Furthermore, Godel's model, in general, does not result in an expanding universe, and hence the issues of dark energy and dark matter are absent. That is because Godel's universal rotation is the rigid rotation of matter, whereas my model proposes a rotating space-time, which naturally produces inertial effects that we, unknowingly, call dark energy and dark matter. 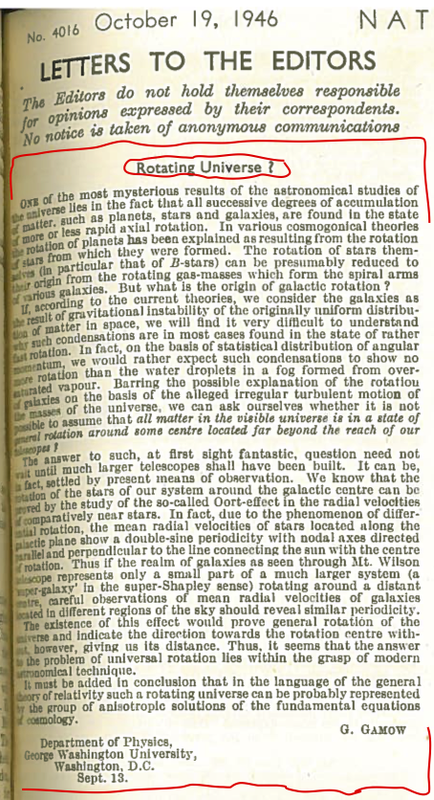 Anyways, at the beginning of this year, I read somewhere online that there is a possibility that Kurt Godel got his cue about a rotational cosmic model from a letter sent to the editors of Nature magazine a few years earlier, in 1946, by the brilliant George Gamow about the possibility of a rotating universe. I immediately ordered a copy of this paper through our interlibrary loan service. Below I will paste it as a picture. Please take a look at it, and note how my "Dark energy and Dark matter as Inertial Effects" paper does point out the same thing as Gamow mentions, particularly, about the shapes of galaxies and how a rotational universe would naturally explain them. I found this to be very interesting and exciting, and more important, profoundly encouraging. So, Just Who is Dhul-qarnayn? Con Coughlin at It Again! What is the Origin of Intrinsic Quantum Spin? For the details, please read my " Dark Energy and Dark matter as Inertial Effects " paper on arxiv.org.